STARS Plastic Surgery in San Antonio, TX strives to provide comprehensive aesthetic solutions, including innovative skin care. We are proud to offer The Perfect Derma Peel, an effective medium-depth chemical peel that is safe for nearly all skin types and tones. The Perfect Derma Peel is noninvasive and does not require preparation before treatment. This peel includes glutathione, a powerful antioxidant that lightens and brightens the skin, slowing the natural aging process to minimize the appearance of wrinkles. The Perfect Derma Peel has also proven effective for the treatment of acne and the reduction of acne scars and pores. Additionally, the treatment improves the overall tone, texture, and clarity of your skin. Meet with a member of our team to create a nonsurgical skin care plan and schedule your skin rejuvenation today. The application of The Perfect Derma Peel takes only about 15 minutes to apply. There is no need for preparation or preconditioning of the skin before the treatment. However, those taking Accutane will need to stop approximately three months before their treatment for optimal results. During the application of the peel, you may feel a slight tingling sensation that will subside quickly. Your skin will become numb within minutes of application. We will use a fan to help keep you comfortable during your procedure. After the peel has been administered to the skin, patients will be released to return home. You should leave the skin alone during the first 24 hours of peeling and should avoid sun exposure and cosmetics. Immediately following application, your skin may appear pink or red as if you have a minor sunburn. Peeling will begin on day three after treatment and will continue up to seven days. 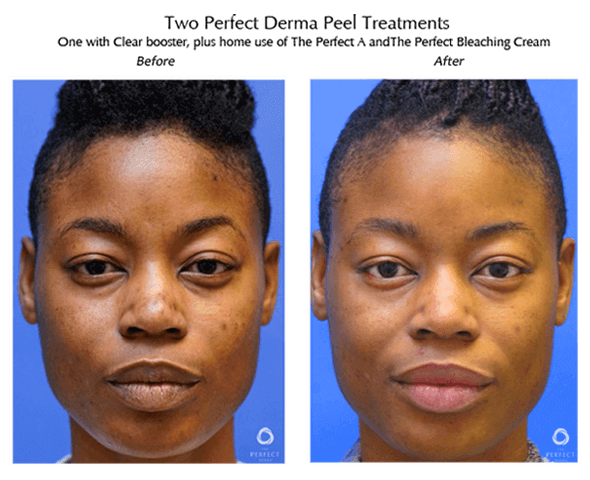 The results offered by this treatment are dynamic and include smooth, glowing skin and a decrease in fine lines, melasma, hyperpigmentation, and sun damage. As long as you care for your skin over the coming weeks, your results will be long-lasting. STARS Plastic Surgery does recommend repeat treatment for patients with more severe skin conditions, such as cystic acne and melasma. However, many patients see dramatic results after just one treatment. How is The Perfect Derma Peel different than other peels? The Perfect Derma Peel is comprised of a unique formula that combines intense ingredients with effective acids for one powerful treatment. This chemical peel lifts fine lines and treats melasma, acne, and other skin conditions in as little as seven days of healing. When compared to other peels, The Perfect Derma Peel offers more comprehensive results in shorter treatment time. 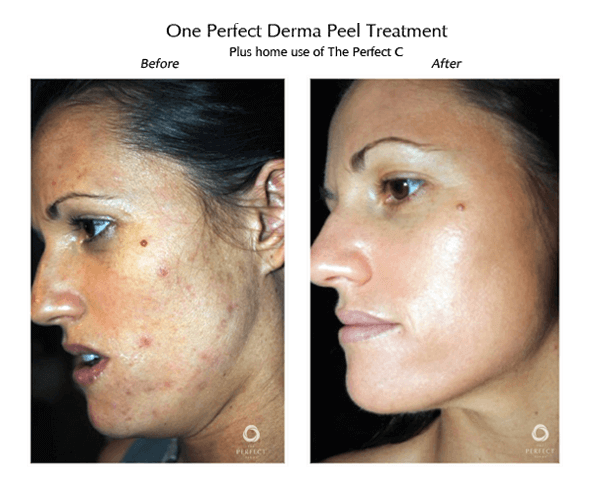 Patients with minor skin imperfections typically see beautiful results after just one treatment while patients with more complex conditions, such as melasma and active acne, may require up to three treatments. Those who maintain an ideal at-home skin care regimen will sustain their results for a long time. Our team can help you choose skin care products that will protect your skin and amplify your results. We recommend the use of SPF each time you will be exposed to the sun to protect your skin from new imperfections. What skin types are ideal for this treatment? Unlike many other peels, The Perfect Derma Peel is safe and effective for use on all skin types (Fitzpatrick scale 1 – 6). How should I prep my skin for treatment? Another exciting benefit of The Perfect Derma Peel is that there is no need for preconditioning or prepping of the skin prior to treatment. Patients using Accutane and Retinols will need to discontinue use at the recommended time prior to treatment so they can attain optimal results. Our team will help you determine when to stop using these medications. STARS Plastic Surgery offers comprehensive solutions for many aesthetic needs to help patients achieve their cosmetic goals and attain a strong self-confidence. Skin rejuvenation is key to maintaining a beautiful complexion, which is why we are proud to offer The Perfect Derma Peel. Ideal for nearly all skin types, this chemical peel will create smooth, glowing skin that you will be eager to show off. Contact our San Antonio, TX facility today to schedule your peel.